Shoulder to Shoulder We Will Fight! Happy Friday to all on this lovely, warm, Boulder day. After long work days, late nights and stressful weeks, I’m sure I’m not the only one who is thankful that it’s Friday. Not only is it Friday, it’s a Friday before a CU football game, which means it’s time for the Pearl Street Stampede! 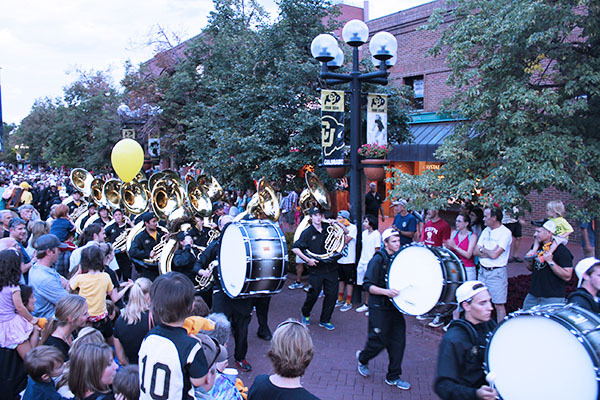 The Pearl Street Stampedes have been Boulder’s way of ringing in the football season for thirteen years! 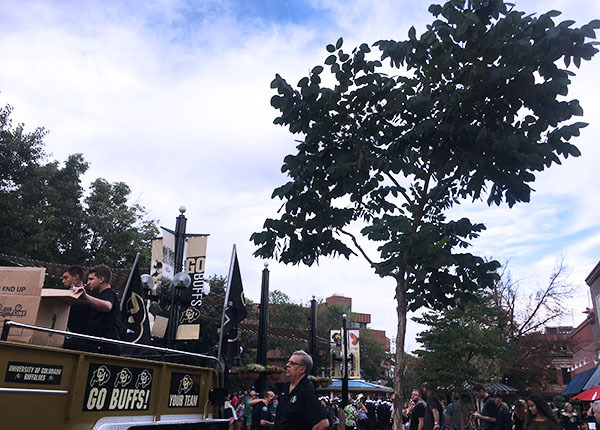 Hundreds of fans come down to Pearl Street to cheer on members of the Buffs football team, along with the dance and cheer teams. The Golden Buffalo Marching Band performs, and march down the brick mall following Stephen Tebo’s fire truck, which leads this one-of-a-kind pep rally down Pearl Street Mall. If you are lucky, you can even meet CU’s mascot, Chip! The Pearl Street Stampede’s have become a football game tradition, and are an excellent way to unwind on a Friday evening. For me, Friday evenings are my time to relax, spend time with friends and go out to eat. Conveniently, there are many restaurants located on the bricks that have a perfect view of the Stampede. I have most recently been on the patio of West Flanders Brewing Co. to view the Stampede, but this is just one of the many places you could watch from. The Stampede begins on the 1300 Block of Pearl Street, and moves West. If you are like me, and prefer to be eating while observing, then Sforno Trattoria Romana, Hapa Sushi Grill & Sake Bar, Japango, French Quarter Brasserie & Oyster Bar, Riffs Urban Fare, and West Flanders Brewing Company all have great patios on the bricks with prime views. Think pep rally to the max! Come downtown to cheer on the Colorado Buffaloes, I’ll be there! This week, stay after the Stampede for Downtown Boulder’s 30th annual Fall Festival! Check out BoulderFallFest.com for more details. Stay and enjoy live music, drinks, and more! 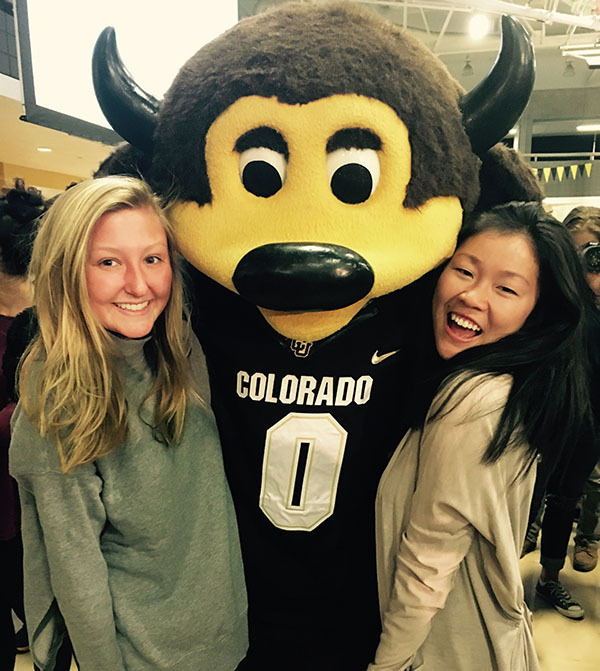 The spirit of CU, Chip the buffalo!